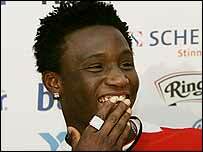 Manchester United and Norwegian club Lyn Oslo have lodged a complaint with Fifa over Chelsea's pursuit of Nigerian teenage prodigy John Mikel Obi. Obi has claimed he was forced to sign a contract with United from Lyn. "Lyn and Manchester United have sent in a complaint on Chelsea and the two agents, John Shittu and Rune Hauge, to Fifa," said Lyn's lawyer Erik Nadheim. United announced the 18-year-old midfielder's £4m transfer on 29 April after he scored twice on his Lyn debut. Hauge has said first division Lyn do not have the right to sell Obi. The 18-year-old midfielder, who Lyn believe is in England, has been quoted in Norwegian media as saying he wants to join Chelsea. Lyn said they have a valid contract with Obi, which runs until the end of 2006, and that he is in breach of that contract after missing training on 12 May and a match four days later. "The only thing that Lyn wants is that Mikel comes back to Norway," added Nadheim.